For dietary management of colic & constipation. Beta-palmitate & partially hydrolysed protein. Contains GOS/FOS (9:1). For bottle-fed babies. Aptamil® Comfort: Food for Special Medical Purposes Our unique blend of ingredients: GOS/FOS (9:1) Our patented blend of Galc- and Fructo- oligosaccharides Reduced lactose Contains 39% of the lactose in Aptamil® First Infant milk. Beta-palmitate & pHP Fat blend with beta-palmitate & easy to digest partially hydrolysed protein (pHP). Suitable as the sole source of nutrition from birth and as part of a weaning diet from 6 months to 1 year. 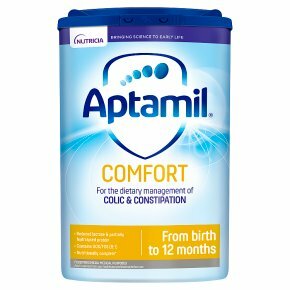 Important notice<br>Aptamil® Comfort is a food for special medical purposes for the dietary management of colic and constipation. It should only be used under medical supervision, after full consideration of the feeding options available including breastfeeding. Suitable for use as the sole source of nutrition for infants from birth and as part of a balanced diet from 6-12 months. For enteral use only.<br><br>Dental information<br>Do not allow prolonged or frequent contact of feeds with your baby's teeth as this increases the risk of tooth decay. Ask your healthcare professional or dentist for advice. Make sure your baby's teeth are cleaned after the last feed at night.